For years, LC Technologies has worked to provide innovative technologies to those who are unable to control their body movement or to speak. For example, our Eyegaze Edge eye tracking technology has given freedom to numerous people, improving their quality of life by leaps and bounds. With our patented Eyegaze Edge Link, we’re bringing even more power to sight. Imagine being able to control even more devices with your eye movements. That’s exactly what the Eyegaze Edge Link can do. 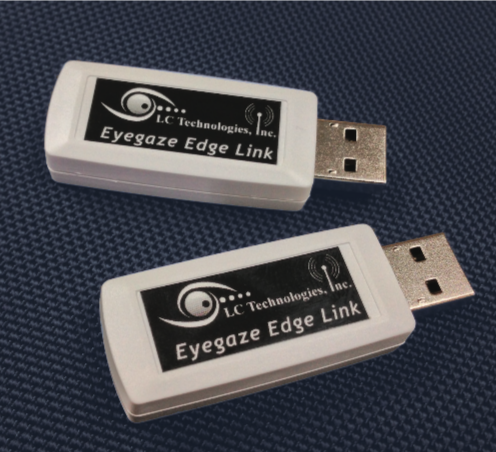 The Eyegaze Edge Link is a pair of USB devices that look like normal flash drives and create a plug-and-play connection between your Eyegaze Edge system and any device controlled by a USB keyboard and mouse. You can connect your Edge device with your smartphone, computer, TV, etc., wirelessly. This means anything with a keyboard and mouse input, including Microsoft Windows systems, Apple Mac systems, Linux systems, and more, can be controlled by eye movements. In other words, we’ve combined the power of Eyegaze Edge with the convenience and versatility of a USB device. With the Link, we’ve eliminated the connecting cables, the SKeys program, the SerialKeysX program, the USB to Serial converters, the software configuration … and all the time lost to configuring the various pieces. The Eyegaze Edge Link is available as an upgrade for any current Eyegaze Edge user or as an option with the purchase of a new Eyegaze Edge system. We’re breaking down barriers for those who rely on assistive technologies, and we know that the Eyegaze Edge Link can be an integral part of daily communication and productivity for our users. Do You Know How Eye Tracking Benefits Society?